Entomophagy is the fancy term used to refer to the act of eating insects. The most commonly eaten insects include beetles, caterpillars, bees, wasps, ants, grasshoppers, locusts, and crickets. They are packed with healthy fats and protein and contain high levels of calcium, iron, and zinc.5 And contrary to what your gag reflex may be telling you, insects can taste really good. Read on to find out how you can find insects and insect protein to eat, as well as learn more of the benefits of this alternative protein source. In 2011, Angelina Jolie told Huffington Post her kids eat crickets like Doritos.6They reportedly loved them so much she had to nix them; she was concerned her children might get sick from overconsumption. So where did Jolie source them? Does she have to fly her children to some foreign country to sample cricket chips? Turns out she doesn’t have to, and neither do we. In Europe and the U.S., we have been slower to catch on to this growing trend. But in recent years, budding entrepreneurs have heard the buzz and pioneered a suite of new technologies and methodologies to allow sustainable production of insects. For recipe ideas, the website Insects Are Food has you covered. Some include cricket pad Thai, cricket fritters, and even chocolate-covered crickets for dessert. If you’d rather breed your own food, LIVIN Farms is the way to go. They developed the world’s first desktop hive for edible insects, raising more than $145,000 on Kickstarter to take their concept to market.11 These mealworms are fed scraps from your kitchen, ensuring the user has control over their nutritional intake. With this system, it’s possible to grow up to 500 grams of protein a week, which is the equivalent to just over one pound of meat. At this point, you may still wonder why people would want to get on the bug train. Why switch out a juicy chicken cordon bleu for cricket du jour? Well, the Earth depends on it. Also, it is well understood that raising livestock is one of the main causes of greenhouse gas emissions, which in turn accelerate climate change. Methane doesn’t last as long in the atmosphere, but according to the Environmental Protection Agency, its impact on climate change pound-for-pound is 25 times higher than carbon dioxide over a 100-year period.14 Insects, on the other hand, can actually help break down waste that would otherwise release heat-trapping gas into the atmosphere. Plus, they require significantly less space to rear. Think how many crickets you could raise in an industrial-sized feedlot. While they make a great food source for humans, using insects for animal feed can help reduce the environmental impact of monocultures such as soy and corn. The FAO suggests the larvae of the black soldier fly, common housefly, and the yellow mealworm have the most potential for large-scale feed production, which would also help to reduce land pressures. The right kinds of insects are good for the Earth and they’re good for you. 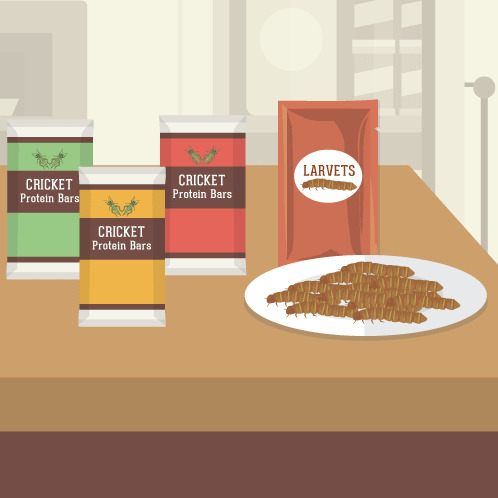 If you’re curious to give some bug bites a go, consider these existing edible insect products. And stay tuned: This industry is growing. If you love a good protein bar before or after a workout, mid-hike, or as a quick, shelf-stable snack for the car, Chapul offers a range of flavors made with cricket protein. Dairy- and soy-free, they offer a sustainable and healthy alternative to existing protein bars. The average 220-calorie bar contains 8 grams of protein, 3 grams of fiber, 27 grams of carbohydrates, 18 grams of sugar, and 8 grams of fat. If your kids constantly ask for sweet treats but you’re reluctant to ply them with high-fructose corn syrup and other junk, consider larvet worm snacks that come in BBQ, cheddar, and Mexican spice flavors. You can also try chocolate-dipped varieties. At just 9 calories apiece, they have a negligible impact on your waistline. This U.K.-based organization has a huge variety of edible insects for sale. From giant grasshoppers and silkworm pupae flour to Thai scorpions, EdibleUnique seem to have one of the largest selections available on the market. Remarkably, buying cricket flour to use as an alternative in baked goods, smoothies, and more is incredibly easy. Companies all across the Internet offer ground-up insects for sale for roughly $12.50 for a pound compared to $8 to 10 for a pound of whey – depending on your sources. Just make sure you choose an organic product that is 100 percent cricket (and not mixed with some other mysterious ingredient). A food revolution is underway as we find better methods of protein production to feed a growing population on a stressed-out planet. With more and more ways to access insects, innovative gourmands continue to make the transition to this brave new world as smooth as possible.